The Redhawks opened Ohio Valley Conference play on March 8 with a three-game series against the University of Tennessee Martin. The series started off well for Southeast, as they won the first game 4-1, but their offense seemed to disappear. 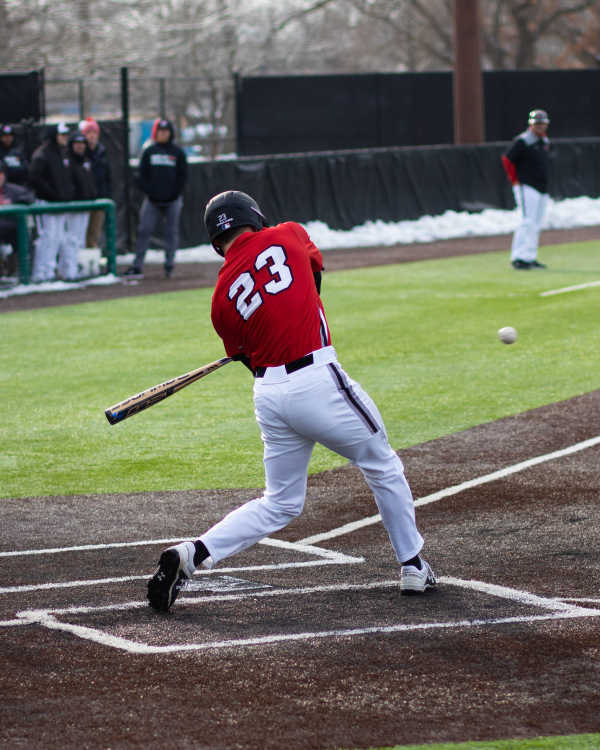 After the rain postponed the second game to Sunday, the Redhawks failed to log a run all day as they dropped both games of the doubleheader to UTM. Southeast fell to 10-5 overall and 1-2 in OVC play with the 3-0 and 1-0 losses. “We got shut out twice today, so I’d like to say we need to score more runs,” Southeast coach Andy Sawyers said after Sunday’s games. In the first game of the doubleheader, both teams starting pitchers came out firing. SEMO freshman Noah Niznik opened the game with seven strikeouts in the first four innings and he pitched into the seventh inning with the shutout intact. He would not get a decision and lowered his season ERA to 0.78. Skyhawks junior southpaw Sam Folks was the star of the game, pitching a complete game shutout, allowing just four hits while striking out three. He held the Redhawks hitless over the first five innings,highlighting their struggles against left-handed pitchers. Southeast is batting 70 points higher against righties than lefties this season. The game remained scoreless until the eighth inning, when UTM’s Ethan Whitley delivered a two-run double off senior reliever Aaron Stretch, who was given the loss. UTM picked up another run in the ninth to win 3-0. Game two of the Sunday doubleheader was a seven-inning match due to OVC rules, and it was another pitcher’s duel. This time around, the Redhawks got their shot against a right-handed pitcher but could not capitalize. UTM’s David Hussey got the win, allowing seven hits over 6 ⅓ innings. Southeast senior starter Dan Bergtholdt made a quality start as well but allowed a run in the fifth after a low throw from the shortstop to first on a potential double play ball allowed a run to score. This would be the only run of the game and it gave the Skyhawks a 1-0 victory. The Redhawks stranded eight men on base and never got anything started offensively in the game. Southeast only used two pitchers in Friday’s game, junior Dylan Dodd and senior Logan Winder. The duo combined for 13 strikeouts, and Winder struck out the last five batters of the game. Dodd picked up the win with his seven-inning, eight-strikeout performance. The Skyhawks picked up their only run of the game in the top of the first inning, as redshirt-sophomore third baseman Blake Daniels hit a home run over the left-field wall. The Redhawks retaliated in the third as sophomore shortstop Tyler Wilber smacked a two-out double down the left-field line to drive in senior right fielder Devon Wilson, who had walked. In the fifth, Wilber struck again with another two-out double. Wilber then advanced on a wild pitch to third, and on the next pitch, UTM’s pitcher balked to send Wilber home. Southeast held off the Skyhawks from there and won 4-1.